Tickets went on sale TODAY, and they sell out fast! These are two really fun events at Gardner Village during the month of October. You don't want to miss it! CLICK HERE for more information and to buy tickets. 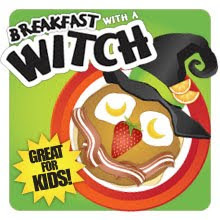 Let your little witches and warlocks enjoy Breakfast with a Witch! Receive a bewitching welcome as you enter the Witchapalooza Dining Hall at The Gathering Place. Enjoy a delicious buffet of fresh fruit, frighteningly fluffy scrambled eggs, haunted hash browns, bewitching bacon, paranormal pancakes, Frankenstein’s French Toast, and of course your favorite bubbling beverage of hot cocoa, coffee or orange juice. As you dine, our whimsical witches will entertain with wonders and cackles. They’ll mingle with you signing autograph sheets, taking pictures and casting spells. The price is only $10 plus tax per person. 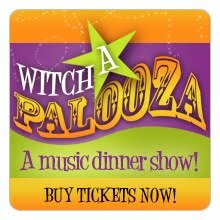 Enjoy an evening of dinner, music and bewitching fun as the Witchapalooza Dinner Theater returns to The Gathering Place. Our beloved Weston the Warlock and his crazy cackling witches are back for another year of memories, music and fun as he seeks to find his true love. Enjoy traveling through the decades with colorful costumes, witty dialogue and an extraordinary musical score. Add to the mix a delicious dinner, and you have the makings of an ideal outing for the whole family.